Coleraine grabbed a deserved three points thanks to Rodney Brown’s first half goal against Ballinamallard United. In windswept conditions the Bannsiders stood firm in the face of the conditions and the visitors to pick up another three points. It was the home side who threatened first as man of the moment Jamie McGonigle exchanged passes with Ian Parkhill before drawing a good save out of Alvin Rouse with four minutes gone. The Bannsiders went even closer five minutes later as James McLaughlin’s goal-bound header was headed off the line by namesake Colm McLaughlin with Rouse well beaten. McLaughlin was looking sharp, latching on to a Ruairi Harkin through ball on 11 minutes, but Rouse saved his snapshot. It was McGonigle’s turn again to try his luck on 17 minutes as he swivelled on the edge of the box before unleashing a low drive, which Rouse did well to get down to. The breakthrough finally came two minutes later through Rodney Brown who won’t score an easier goal. He played in Parkhill, whose shot was blocked by Rouse, but as the Ballinamallard defence attempted to clear the ball they only succeeded in teeing up Brown to tap home from a yard out. He should have made it 2-0 seconds later as Parkhill picked him out at the back post, but the wide man somehow headed wide from close range. Ballinamallard started the second half in better fashion with the strong wind at their backs. It was the home side though who came close to scoring as Brown had another header cleared off the line from Higgins’ corner on 53 minutes. The Bannsiders had a let off just after the hour mark as Doherty spilled Shane McCabe’s inswinging free kick, but Douglas managed to hook the ball away from danger. Howard Beverland almost gave his side breathing space on 72 minutes, but his volley sailed the wrong side of the post. Two minutes later Rouse denied Brown again. 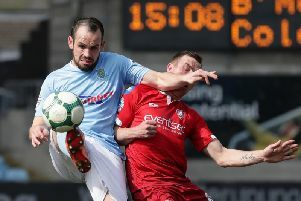 The visitors almost grabbed an equaliser right at the death as Liam Martin’s wayward cross flew goalwards, but Doherty did well to tip it over the bar.